For Sadie, our little Westie, who waited patiently at the gate for me to return. Sadly, a month after completing my ride, her cancer returned and she had to be put to sleep. We miss you. 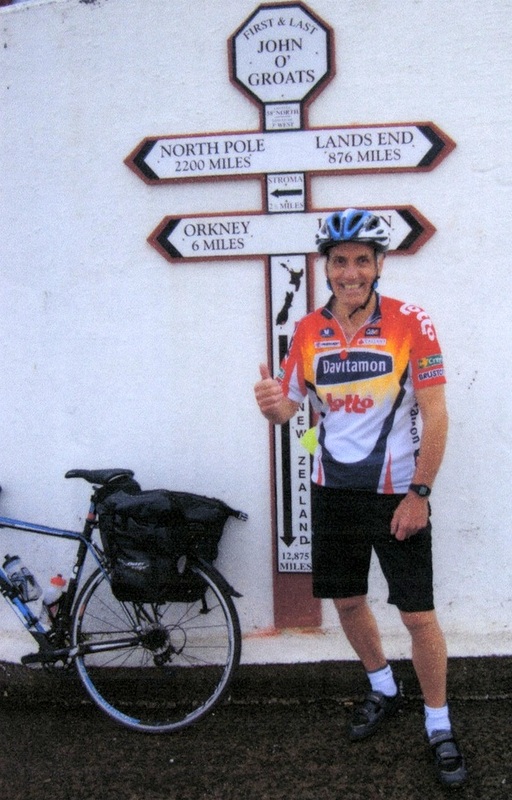 In 2009 I cycled End-to-End on a three-geared postman’s bike, borrowed from the local post office. “A postman’s bike”, said my mates, “you must be mad.” Mad or not, over £5,000 was raised for Clatterbridge Oncology Department. 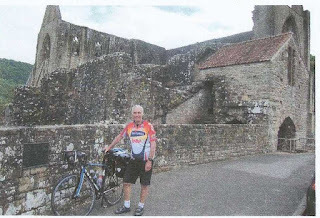 In 2011, the year of my 70th birthday, I decided to do a “there and back” ride. Things don’t always go to plan, and after starting from Land’s End and reaching the Severn Bridge, I had a fall and a bad injury that ended the challenge – well, for five weeks anyway. After some TLC from my wife Thelma, and a promise not to use the post bike, I was able to complete the journey to John o’ Groats from where I’d left off, this time on my road bike. It was a wonderful feeling to have completed one part of my journey and the support and sponsorship I received left me feeling quite humble. Nobody expected any more from me. I had been worried about not completing the full challenge, but everybody kept saying that I didn’t have to do the other half. But when I was handing the cheque for £3,500 to my chosen charity I made a promise to myself that one day I would finish what I started. The timing was a snap decision, as I’d had a chest infection so wasn’t able to do much cycling. However, during the last week in May we decided that I was fit enough and because of other family commitments, now was the right time to go for it. Train tickets and B&Bs were arranged within three days, and Thelma was able to book with all the people we’d had to cancel with in 2011. That pleased me, as this was just one of the many End-to-Ends I’ve completed and in the past I’ve always tried to stay at the same places. My bike was prepared for the journey by John (owner) and Mike (head mechanic) at College Cycles, one of, if not the best cycle shops in the North West. 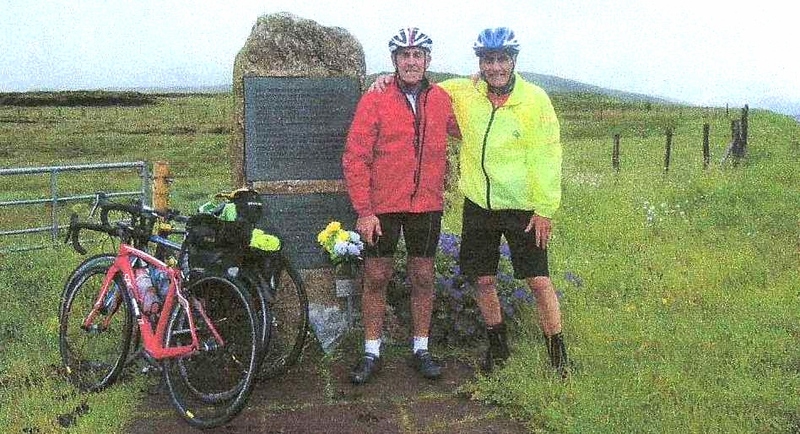 We sent it by courier to my first B&B in Scotland, and on the day of departure my good mate Oz kindly offered to give me a lift to Wigan station. 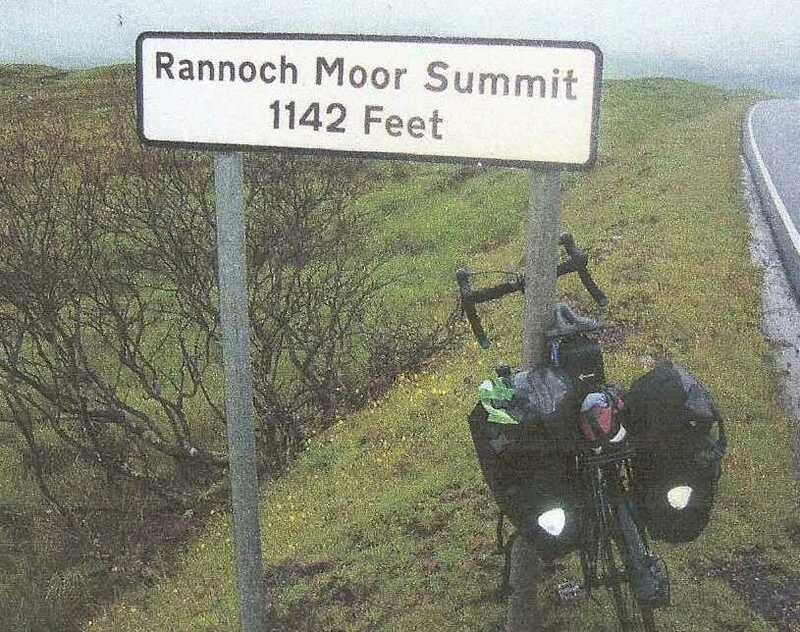 When taking on any challenge I feel that much is needed – willpower, strength, determination, tenacity and a fighting spirit – and that’s just for the train journey to Wick, never mind the 1,000 mile bike ride! On 1st July, my alarm went off at 4am and I was up, showered, fed and watered and waiting for Oz to pick me up at 5. The train took me from Wigan to Haymarket, then I changed for Perth to Inverness and finally Inverness to Wick. You can imagine what it would have been like dashing with the bike and full pannier bags from one platform to another, with perhaps only a few minutes between trains; hence the use of the courier. On the train I met a gentleman who was visiting every National Hunt Race course in Britain and he only had two more to visit. I bet he has a nice rose garden! The journey from Inverness to Wick was long: 4 hours, 24 minutes. I noticed a female cyclist on the train and wondered if she was doing a JOGLE also. The train arrived bang on time at Wick and I had a 15 minute walk to my B&B to be reunited with my bike, hopefully in one piece! At least I knew that the bike had arrived, as I’d received a kind telephone call from my hostess Mrs Leask to confirm this. I had an early night, and dozed off listening to the raindrops on the bedroom window. I was up early and in no time at all the silhouettes of the JOG complex appeared in the distance. Having made my way to the famous signpost I met Walter Mowat, a local man with a great sense of humour. From his business card it seems he has a hand in most of the businesses within the complex. He obliged me with a photograph and then showed me over to a signpost painted onto the wall of his gift shop. He told me that this sign was older than the other one, and proceeded to take another picture. “Thanks,” I said, and then made my way to the Seaview Hotel to have my verification sheet stamped to mark the start of my journey. with magnificent views across the many bays, I stopped to take a photograph of the Scrabster ferry terminal. When signs for Bettyhill appeared, I decided to have tea and tab nabs at the Information Centre and Café on the road to Syre. I’d stopped here before and remembered how friendly the staff were. When parking my bike I noticed another one next to mine which I recognised. Sure enough, sitting in the café was the girl I’d seen on the train to Wick. I introduced myself and asked if she was doing JOGLE, to which she replied “No,” but went on to tell me how she travels on trains then cycles to different places. Quite a nice way to see the country, I thought. On leaving, she said that she might see me on the road tomorrow, but I never did. I was soon at Lochinver and was impressed by how lovely the scenery was; it gave me a good feeling to be riding in such beauty with the stunning colours of the flora. At 5:45 I reached the hamlet of Altnaharra, my B&B, and a warm welcome and tea from Mandy the hostess. I’d covered 93 miles, with the last stretch from Bettyhill being traffic free. I showered, and tucked into a super chicken dinner and had a good chat with Mandy’s husband. After breakfast I was on my way. There were lots of climbs ahead but I kept up a nice pace and was soon passing the Crask Inn. I stayed there on my ride in 2011 and I now noticed that it was up for sale. The dozen miles to Lairg soon passed and then onward to Struie Hill. This was a tough little climb especially with full pannier bags, but I made it to the top without stopping. The views from here are stunning. I always seem to meet kind people on the ride, and today was no exception. I’d emptied one of my water bottles and still had a few miles to go before I could replenish it. I began talking to a couple, George and Liz Mackey from Leamington, who were touring in a car. George offered me a bottle of water, a nice gesture which I accepted. I still had eight miles of climbing ahead of me, and then it was fairly flat. 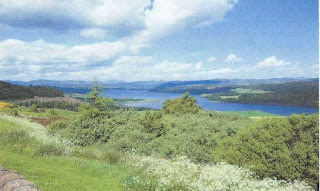 There are more wonderful views as you ride through Bonar Bridge, Alness, Dingwall, Muir of Ord and then Drumnadrochit. I stopped at Urquhart Castle for a photograph. Built on a rocky peninsular on the banks of Loch Ness, the castle has a somewhat chequered history. Founded in the thirteenth century, the castle changed hands many times from Edward I, Robert the Bruce (1300) the Earl of Morey (1346), Clan MacDonald (1400) and more, until it was left in ruins in 1692. It is now run by the National Trust and has a first class visitors centre. The tour guide, in a kilt, was having a laugh with the visitors and I heard him say, “There it is over there,” referring of course to the famous Nessie. I chipped in with, “Aye mate, I’ve seen it three times you know” (joking of course), to which he replied, “Oh aye, so what have you got in your water bottle then?” Everyone had a good chuckle. In 1977, a bloke named Anthony Shields said he saw Nessie from a place close to the castle – but I don’t suppose anyone believed him either. Before long, I reached Fort Augustus and was greeted by my B&B hosts Phil and Clare. I ate a fish and chips tea sitting outside by the canal lock gates; it was a nice evening and loads of people were doing the same. The ladder of locks lowers vessels from the Caledonian Canal to the level of Loch Ness. Following a vessel through the locks is an ideal way to understand how this simple process works. On my way back to the B&B, I noticed some ornate structures behind the house. Clare told me the structures I could see from the breakfast conservatory were the supports for the viaduct that carried the Invergarry railway, and showed me a postcard of them. After a wonderful breakfast I was off in the rain, heading for Crianlarich. I was soon through Invergarry and arrived at Spean Bridge, wet but undeterred. 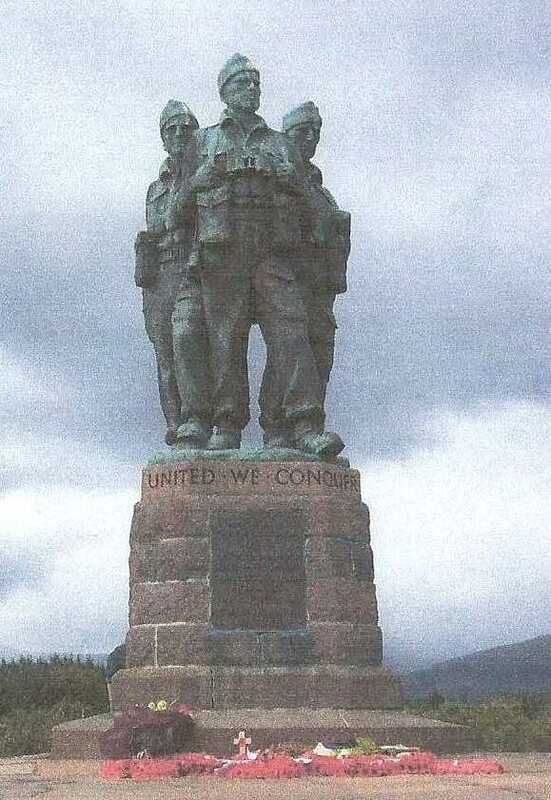 I usually stop here to pay my respects at the Commando Memorial and today was no exception. Despite the horrible weather conditions there were lots of other visitors too. After paying my respects, it was ten miles to Fort William for my next stop and something to eat. When I arrived, the rain had stopped so I walked through the shopping centre parallel to the A82. This meant that even though I was walking, I headed in the right direction. I had a conversation with an overseas tourist who like me, had unsuccessfully tried to use a public payphone. Although there were four boxes side by side, nothing was working. We just laughed over the matter and she said in very good English that she’d try further down the road. Don’t hold your breath, I thought: I’d travelled from JOG and still hadn’t found one working. Sadly, this would continue until I arrived at Penzance! I continued walking through the shopping mall and then, there it was: a fresh “Cooked as you Watch” food shop. I had a pork and apple-sauce bap and a carton of tea, yummy! Then I was back in the saddle until a comfort stop at the Corran Ferry Jetty. This is a nice spot, and I watched the cars boarding the ferry and took some photographs. As I sat taking in the scene, I recalled that when I was here in 2009 a couple of climbers gave me £10 sponsorship which I thought was a kind gesture and something I would never forget. The rain started again and so it was back on with the waterproofs and onward and upward, literally. Usually as you travel through Glen Coe you hear the sound of bagpipes and are greeted by a piper, but not today. I can’t blame him, as it was pouring with rain and if he had any sense he’d be sitting at home enjoying a single malt! However, I missed hearing the sound of the pipes as I have always loved them, ever since I was a small child. I find it to be very stirring, especially in the glen and for the first time, when you are not expecting it. I have ridden through Glen Coe many times and I always sense an eerie feeling in the air. Perhaps it has something to do with its history of feuding between the Campbells and the MacDonalds, and particularly the heinous crime of 1692, when the Campbells slaughtered forty of the MacDonald clan. 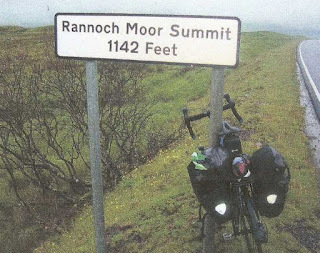 Soon the road started getting steeper; I was climbing up onto Rannoch Moor. Despite the heavy rain, I stopped to take photographs of this wild and beautiful place. It’s hard to express the feeling you get when you are in this particular spot. No matter the weather, it’s nature at its best, with the mountains and colours. This is the part of Scotland I love. Approaching Tyndrum followed by Crianlarich, I had my Frank Spencer moment: I’d stopped to have a drink and text home, but there was no place to lean my bike, so I leant it against my body. I needed my glasses out of the pannier bag to see the text I was about to send. After retrieving them I opened the case, took out the glasses and put the case on the carrier. Then to my dismay, the lens fell out of the glasses and slipped between the slot in the seat, so I put the glasses down on to the carrier to reach for the lens, the bike moved, and the glasses fell off the carrier. In an attempt to catch the glasses, I knocked the case off the carrier and into the water. Meanwhile, the midges had found me and I watched in horror as the case was floating away. Now I did what I should have done in the first place: set my bike on the ground. Phew, some mothers do ’ave ’em. Having solved my problems, I cycled on, arrived at my digs and met my hosts Phil & Wendy. I’d completed a good 86 miles, surrounded by some of the most beautiful scenery in the whole country, and despite the rain I really enjoyed it. Tomorrow would be a comparatively easy ride, or so I thought! The following morning I was off like a shot heading for Loch Lomond with a bacon sarny tucked in my saddle bag. Again the views were stunning and the rain was on and off, as were my waterproofs, but who cares? The roads were quiet which enabled me to set a steady pace. I was soon having tea and tabs at the cruiser moorings at Tarbet. Whilst here, I took some nice photos of the distant hills across the loch; boy it makes you glad to be alive. I was soon pedalling away again to approach and cross the Erskine Bridge and find Cycle Route 7 for a traffic-free ride to Troon, but I nearly did not make it! Having crossed the bridge, I travelled along the A737 looking for my turn-off to Johnstone, but for some reason I turned off too early and found myself on a little trading estate. I turned around to head back, and was waiting at the junction to turn right when suddenly I saw a grey car heading straight for me. It was being driven by a young man who had cut the corner turning right into the junction, but obviously did not see me even though I was wearing a high viz jacket. I tried to move to my left but he clipped me, causing me to lose my balance, bounce off the bike and bang my head on the ground. My immediate thought was: that’s the end of my ride, but miraculously, I was ok. I stood up, but the man drove off. That hurt me more than anything. After checking my bike, I rode on to the A737. I did not tell anyone about the incident, especially my wife Thelma, until I had finished the ride, as I knew she would have tried to stop me carrying on. I continued to the next junction at Johnstone and there was the entrance to the cycle route. Yippee! 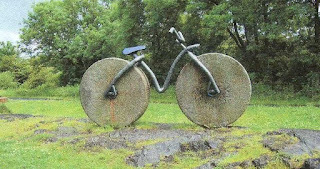 There were quite a few people using the path and as I stopped to take a photograph of the bike sculpture, a lad and his dad out walking came over for a chat, asked where I was going, and wished me well. The rain had finally stopped and the sun came out as I made my way into Troon to a lovely welcome from my hostess Mrs Mathieson. I have stayed here a few times before and have always been made to feel at home. I was pleased to have arrived safe and sound, and I enjoy Troon, as it reminds me of where I live on the coast. The views out to sea from the front window are lovely, plus the path to the cycle route is just across the road from the house. I enjoyed a nice tea and after my experiences today decided on an early night. Although the 83 miles covered today had been an easy ride and the scenery beautiful, the incident with the car made me feel a bit wary. Next morning, I was somewhat taken by surprise when Mrs Mathieson asked, “Would you like this?” holding up a beautiful Remington 5 portable typewriter. In an earlier conversation I had told her about my typewriter museum at home. “I would love it” said I, “but can’t fit it in my bags.” She just laughed and said she would post it on to me. How kind was that! I was soon speeding along Route 7, heading for Kirkcudbright to stay with my friends Rod & Barb and their young family. Most of the route today was coastal until I reached Girvan. I stopped in Ayr to take a photo of the birth place of one of the town’s famous sons, Robert Burns. Then it was an undulating ride to Ayr Head – the coastal views here are terrific – and on to the café at Barrhill where I arrived absolutely soaked. I was hoping to see the naval PTI [physical training instructor] I’d met previously on my post bike ride. Unfortunately, he was out! However, after drying off, a bacon and egg barm, cake and a mug of tea took care of the disappointment of missing him. I left my best wishes with his very able assistant and made my way to Newton Stewart through 18 miles of traffic-free nature reserve. Wonderful! You see so much when cycling, with no engine noise to frighten the wildlife: a fox was racing ahead of me; I think it had spotted some geese for dinner! I was glad when the Kirkcudbright turn-off appeared and I arrived in the town centre at 8pm. I was soaked through, and starting to feel the cold. Like a lifeboat, my friend’s van appeared and there was Rod’s wife Barbara waiting to transport me to their home. I’ve stayed with Rod and Barb a few times in the past. It is such a lovely place, and I have always been made to feel so welcome. This time was a little different as I was introduced to their new family Brooke & Bailey who were wonderful, and not a bit shy. After a bath and a lovely meal it was nice to sit and chat with the whole family before bedtime. I’d travelled 94 miles today, mostly in the rain. Next morning, Rod said he’d ride with me to Penrith and take the train back to Kirkcudbright. The children, with Barb supervising, rode with us to “the bottom gate” where we said goodbye. It was good to have Rod’s company and he set a steady pace heading for Gretna and the road that ran alongside the M6 which took us to Carlisle and then Penrith, virtually traffic free. The weather and banter we shared along the way were good and we stopped in Annan for tea and pies which Rod kindly bought. We met a young lady who was doing the End-to-End and had taken the wrong turn, so we suggested she follow us for a while to get back on route. She had no panniers on her bike and I subsequently found out that she was doing a hundred and thirty miles a day – wow! No wonder she didn’t have panniers. It is likely that she was accompanied by a vehicle because after leaving us to bomb ahead we passed her again and she appeared to be on a mobile phone. Of course this was pure supposition but at least she was on the right road. We were soon through Carlisle, the weather was fine and Rod found the road alongside the M6 to Penrith. It was a good day’s ride, and we both enjoyed the conversation, the views, and cycling traffic-free. The company was a welcome, unexpected change. I rode up to the station with Rod where he was able to buy his ticket on the train. We said our goodbyes, and I had a look at the castle opposite the station, which is set in a public park. It dates back to the early 14th century, and was founded by Ralph Neville to be used as a defence against Scottish raids. In 1471 it was expanded and made into a royal castle by Richard III, enhancing the interior and adding a strong North gate. After a shower at my B&B I treated myself to an Italian meal out. I began talking to a lady at the next table who owned a B&B in Drumdrochit and had come down to Penrith to pick up and ride home a 750cc motorbike she’d bought. Amazing! It was then back to my digs. The following day I’d be covering 100 miles taking me over Shap, then a nice easy ride home to Hightown. It would be good to see my wife and our little Westie, Sadie. I enjoyed a massive breakfast, and bid farewell to my hosts Allan & Moira. I stopped in Shap village for a drink and then set off for the steady climb to the top of Shap. I was getting fitter, and was heartened by the fact that I would soon be on the last bit of the climb. In the distance was the monument dedicated to lorry drivers who, before the M6 came into being, used the route in all kinds of weather, as they brought goods and food supplies to towns and villages further north. I always stop and take a photo here and think about my Dad who was a lorry driver himself and often travelled this route. Despite the fine rain and mist which is nearly always present at the top of Shap, the scenery was wonderful, wild and rocky with different coloured heathers and trees. The monument and the phone box were all the things I expected to see, but what I did not expect was someone shouting, “Les! Les!” In the distance I could see two riders approaching. I could not believe my eyes: it was my good friends Jim & Sue Thomas from Formby. What a lovely surprise! The amazing thing is that we had all arrived at the top at the same time – how spooky. A big fuss was made and photographs taken. We rode down into Kendal like three Exocet missiles. Sue found a nice café, we bought lunch, and spent two of the most pleasurable hours I’ve enjoyed for some time, eating, drinking and chatting. It was so kind of them, riding to the top of Shap just to greet me. It’s something I will never forget. All too soon, Jim and Sue were heading back to her cottage and I to Hightown. I arrived home to a nice welcome from my wife and Sadie, who Thelma told me had waited at the gate until almost eleven o’clock every night for me to come home. I’d ridden 101 miles today, and tomorrow was a rest day before I set off for the last four legs to Land’s End. On my rest day John & Mike checked over my bike at College Cycles – thank you. It was nice to spend some time with Thelma and Sadie who is in remission after being diagnosed earlier in the year with bowel cancer. I gave some thought to how I would get from Hightown over to Birkenhead. In the past I’ve tried a few ways: riding through the Mersey Tunnel at 5am, and also over the Runcorn bridge. This time I decided on the luxury of getting a lift through the tunnel and once again my mate Oz obliged. The weather was perfect for riding and being a lot fitter, in no time at all I was passing through Chester. It helped that the traffic was light and there were no hills to climb. I aimed to reach Broxton on the other side of Chester by lunchtime. There is a super café there where I always stop for a snack. At Church Stretton I was only half an hour’s ride away from my stopover at the Affcot Lodge so I had a walk around the shops. We’ve stayed in this area for holidays over the past several years, and I called in at the bike shop where I met the owner five years ago when it first opened. After a nice chat, and telling him what I was doing, he wished me well for the rest of my journey. Next stop was the ice cream parlour. Seeing me in my cycle gear with the bike and panniers, the lady behind the counter asked where I was going. After telling her the story she said, “Good for you, going to finish it! Have the ice cream on me.” What a nice gesture, I thought. After my refreshing break, I was soon at Affcot Lodge, where I’ve stayed on several occasions, and was made to feel very welcome. In the dining room later I had a brilliant three course meal. What a good day it had been, and 87 miles further. Today I’d be covering 68 miles, my shortest day. At a garage in Hereford, I wondered what was causing the rattling noise in my pocket. Oops! The key to my room at Affcot Lodge! I asked Thelma to give the hotel a ring and explain what had happened, and say I would post it to them on my return home. The scenery along the Wye Valley was as picturesque as ever with the pines, birch trees and rhododendron in full bloom. Boy, did it make me feel good inside! I was now heading for Chepstow and soon arrived at one of my favourite places, the ruins of Tintern Abbey. The place has a special tranquillity about it. 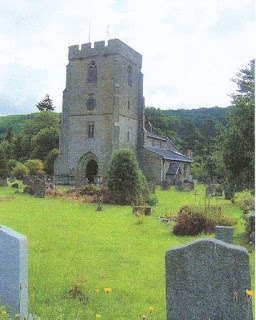 Founded in 1131 by Walter Fitz Richard de Clare, the Earl of Chepstow, it was run by the Cistercian Monks and was the first such Abbey in Wales. It is now in the care of English Heritage. I asked a motorcyclist if he would mind taking a photograph, and he kindly obliged. 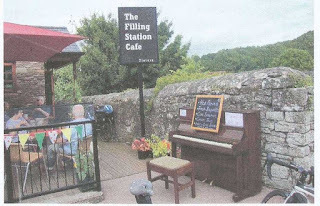 There’s a new café near the Abbey called The Filling Station. 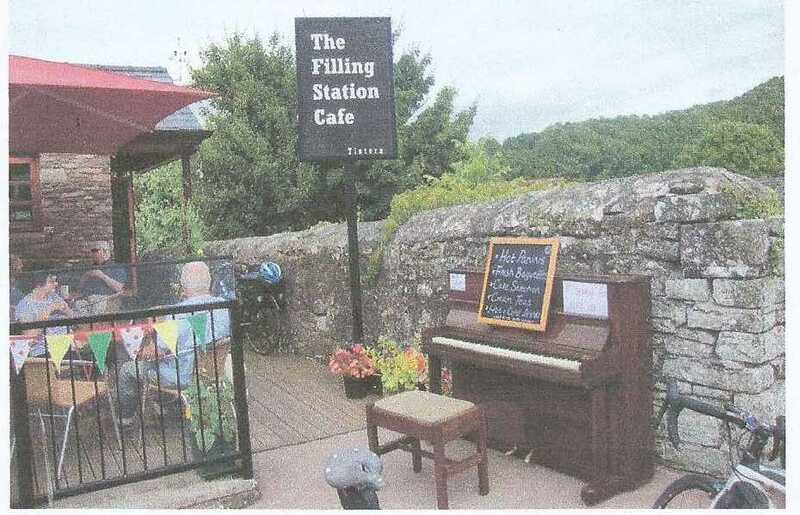 It has a piano for sale outside, and a sign saying cyclists are welcome. I introduced myself to the owner who is a biker himself and has also completed the End-to-End. I showed him my diaries which I was delivering on request to my host at Chepstow. He photographed them and said he would put them on Facebook, which might get me some donations for the charity. I do hope his business is successful; how refreshing (excuse the pun) to see something different, and biker-friendly! A mile or two along I passed a bad accident involving a motorcyclist and car. Paramedics were in attendance and I didn’t stop and gawp. There were loads of people around, and I could hear the sirens in the distance. I just hoped that it turned out okay for the injured parties. I arrived at Chepstow and was welcomed by my hosts, Elizabeth and Rod. We spent a while chatting and I gave them the diaries of my 2009 and 2011 rides. 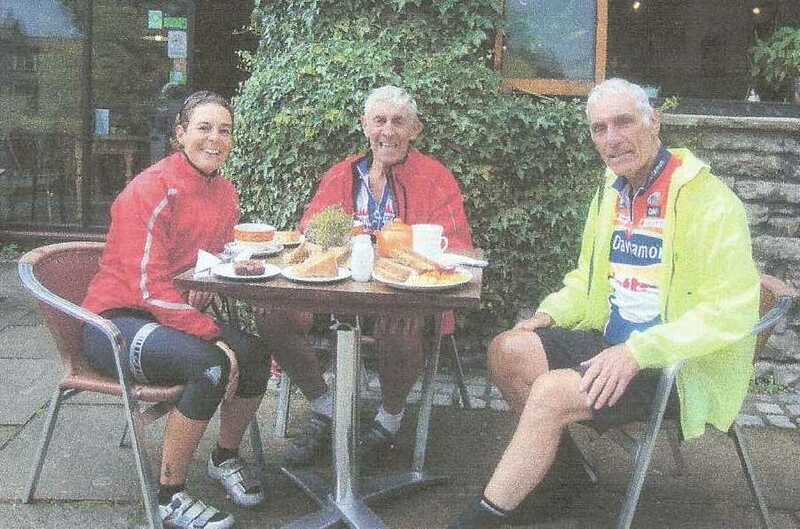 They both had been kind and sympathetic in 2011 when I had my accident, and I’d promised them a record of my journeys. The next morning I was up bright and early for… yes, you’ve guessed right: a full English breakfast. I’ve always enjoyed staying at this particular B&B and think it must be one of the best in the country. The accommodation is immaculate, the food first class, and you’re always assured of a warm welcome. I was soon on my way, passing the racecourse and onto the Severn Bridge, with a quick glance at the spot where I came off my bike in 2011. I went under the Clifton Suspension Bridge onto the A38, passed the airport and then it was a steady damp plod to Bridgewater where I stopped off at a garage for a coffee and a bite. The bloke at the garage must have felt sorry for me and treated me to the coffee which was much appreciated. Although these little stops I made along the way were only for a short time, they were a necessity and gave me the calories I needed to continue with the journey. I was soon through Taunton and Wellington heading for Cullompton and then, oops! I took a wrong turn at the roundabout and was heading for Tiverton. By the time I realised, it was too late to turn back. “It’s only 7 miles,” I said to myself, and was soon at Tiverton, heading to Exeter. It was quite a hilly area but with some lovely views. I was now only a few miles away from the city centre and had completed 105 miles with just 12 to go before Moretonhampstead. I knew what to expect now. As soon as you reach the B3212 there’s a climb which is probably only 100yds but it makes your legs burn, especially when you have pannier bags. “Well done!” a guy shouted who was working in his garden. “The last time I did that I was on a post bike,” I replied. “How did you manage that?” he marvelled. I went into the Co-Op for a pint of milk and two bananas to give me some energy, and then onwards and upwards with climb after climb. On arrival at my destination, it was a warm welcome from my hosts Richard and Ann, a long, hot soak in the bath, and food! Then it was off to bed, having completed 117 miles in the rain, but with just one more ride ahead of me to Lands End. On top of the moor, I once again marvelled that even in these dank conditions, how wild and beautiful this place is with its rocky terrain, and rugged landscape of bushes, wild flowers and the many shades of green. This time I did not see any wild ponies but taking into account the weather conditions, they probably had more sense than I did. I saw very few cars and even fewer cyclists. I needed to be wary of the sheep wandering all over the road, and the many cattle grids, especially in these wet conditions. A farm animal transporter came zooming around the bend and I hoped he was aware of the sheep. Then I heard the blast of a horn. Aah! So that’s how you get them to move on – much better than the bell on my bike. Later, I noticed a light coming towards me and eventually five bikers emerged out of the mist. They gave me an encouraging shout, “Keep it going, mate!” and then disappeared back into the mist. Having panniers on my bike must have indicated I was heading for Land’s End. It was nice to see other people on the moor; I think they were club riders. It gave me a bit of a boost. On my descent from the moor, although it was still raining, visibility began to get better. I picked up my pace and saw the signposts for Tavistock. I rode into the main street and recalled that I had to make a right turn at the statue of Sir Francis Drake who was born in 1540 and brought up here (Just thought you would like to know that). I passed through Liskeard and St Austell and the signs for Truro appeared. I kept having my usual stops at garages and shops en route to fill up with water and food, and my spirits were high getting closer to Land’s End. I had been feeling really good throughout the trip, and although some nights I was tired, I never felt I wouldn’t be able to make it, and I am very thankful for that. Before I knew it I was out of Truro and heading for Penzance. I knew my final day’s ride was going to be long, with a late finish, and had brought lights with me which I now switched on. I was wearing my high viz cape, and just needed to keep left of the white line at the side of the road and I would be fine. The traffic was light and drivers in this area are very tolerant of cyclists, knowing where you are probably heading and giving you loads of room. It was pitch black once I had cleared Penzance and I could only just about make out the centre line of the narrow road with my small front light. I was nearly there, and despite this being my tenth trip, I was as excited as ever. Within ten minutes, I was crossing the finishing line. It was 00:45. I wandered around the complex hoping that as in the past when I arrived late, I would find the night porter, but I was disappointed. It would have been nice to let someone know, there and then, that I had done it. All I could do was take a photograph of my bike outside the deserted restaurant door. There was no signal on my mobile phone to ring home or my B&B, and I’d have no sleep, if I didn’t put a move on! So I got on the bike, and headed back to Penzance. It was hard to see the bends in the road, and was I glad to see the lights of the prom at Penzance approaching and a phone box that actually worked! I only had a £2 coin on me but I got through to the B&B. It was 2:30 but Chris answered the phone. He had kindly waited up for me, and it turned out that I was only 5 minutes away from his front door. I was so pleased that I’d managed the day’s 134 miles, and at last had completed my challenge. After a few hours’ sleep I was up again, feeling relaxed, and again thanked my host Chris for waiting up for me. It was a short ride to the station and the train for home. I reflected on my ride, the ups and downs (literally), the incident with the car, and the weather. 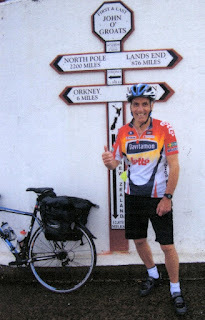 I had cycled 1,052 miles in 11 days, not bad for an “old fella.” I felt elated. When I arrived home, Thelma pointed out that my foot was very swollen and bruised. I hadn’t noticed this during the second half of my ride and was very puzzled as to what could have happened! Then I remembered that during my rest day, I stood on a garden table to reach something, as you do, and the table collapsed and I’d ended up in a heap on the floor! Mystery solved! I couldn’t believe that I had ridden over 400 miles with a badly sprained ankle - pity the table wasn’t as strong! 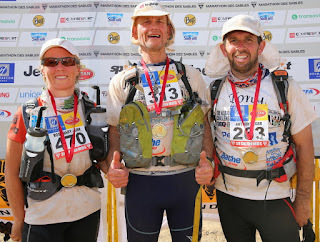 Waking up on 13th April, I pinch myself: have I really just completed the Marathon des Sables? An event that took me on a journey across the Sahara desert, covering 156 miles (251 km) in 6 days! The answer is yes, making me the first English-born blind person to do so! Did the title it holds, “The toughest foot race on the planet,” apply? The answer once again: yes! What a journey; what a challenge! What amazing guides and pals, Tony Ellis and Rosemary Rhodes, who helped me to success through all the pain, heat and exhaustion. How did I ever considered doing this in the first place, and how do I start describing it? I guess the obvious place is the start line in that barren place, with 1,300 other competitors, standing in the clothes we’d wear for the week, carrying all our supplies on our backs, anticipating what the desert held in store for us… but no, it all started some 18 months before. 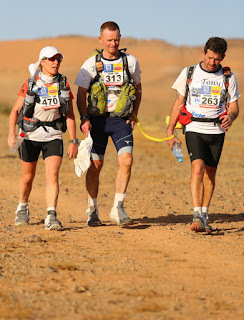 I’d had my eye on the Marathon des Sables for a few years, but no one seemed too eager to guide me, and then came Tony! He described the time he ran the MDS, how tough it had been, and said he would never set foot in the desert again unless (yes there was an unless!) “you let me guide you,” was his comment. A week or so later Rosemary also showed a keen interest in taking part, and suddenly we were in! All three of us entered the 2015 event. Tony has sworn at me on more than one occasion since, not believing for an instant he was actually going back to that desert. The deposit was paid and training began, with the realisation of what the whole event entailed! How do you train to run – or walk, for that matter – in the sand? In the blistering heat of the desert? There are not many beaches in West Bromwich and the sun is a commodity not found too easily around here, but with our own experiences from previous challenges we began to put a formula together. We ran some serious miles; we walked just as many, and also climbed a few hills: the Wrekin and Sandwell Valley became home-from- home. We trained on the Breckon Beacons, and took part in a 50 mile event around the Gower peninsular; this certainly took off-road training to a new level for me. We went up and down Snowdon, wrapped up well; we trained in the rain and the snow – how far removed is that from any desert! After a few months we introduced a backpack with a 10kg weight in it. We would be in the desert for over a week, so the pack needed to be full of essentials. Martin and Sue Like, of Likeys, packed my bag to perfection: from my socks to my hat, meals, a pot and cooker, spoon, sleeping bag, and a jacket for the night. (“In the desert?” I asked. The little lightweight coat was a godsend on a couple of occasions as it went from extreme heat in the day to what felt like freezing at night.) Likeys also supplied water bottles, electrolyte tablets, and a tube of wipes for cleaning. (Little tablets, once water was applied, turned into a cloth!) Everything was small and lightweight; once it was all packed in the new bag and the straps were pulled tight, that bag and its contents fitted like a glove. We spent our last week of training at the University of Birmingham. They very kindly allowed us to use their humidity chamber, under the guidance of Becky and Dr Sam Lucas, and it gave us some idea of the temperature we could expect in the Sahara. On 3rd April we flew out of Gatwick on the first of three chartered flights, leaving at 9am and arriving at Ouarzazate, Morocco, early afternoon. Then we spent 6 hours travelling by coach to the bivouac, our home for the week. Ours was Tent 124, a Bedouin tent: a carpet overhead with 4 poles, one at each corner, rough matting on the floor, and entry flaps at the front and back. There were 5 of us in our tent, including two of Rosemary’s friends from Dubai: Anne Marie and Leslie. After the 16 hours of travelling, we had food provided by the organisers, and then it was sleeping bags out, and our first night in the desert. I didn’t get much sleep: the air-filled mat underneath me sounded like a crisp packet every time I moved, and my blow-up pillow certainly made me appreciate the comforts of home! In previous years, the toilets were holes dug in the sand, but the organisers took things up a level to four poles draped in plastic sheeting: about 5 constructions in a row for everyone to use. The queues were long, first thing in the morning. We were issued with a plastic bag, and while waiting in the queue, we collected a couple of stones. There was a bucket to house our plastic bags; we then dropped in the stones to hold the bag down. We had to squat down whilst one foot held down the plastic flap which represented a door (and being blind, it’s difficult). After doing our business, we removed the bag from the mop bucket, grabbed all four corners at once, tied a knot in the top, and deposited it into a bin outside. Rosemary had the job of assisting me on a morning; unfortunately there was the occasional accident – I’ll leave the rest to your imagination! After queuing for our water rations and having breakfast, once again supplied by the organisers, it was time to sort out our backpacks. We packed, unpacked, and repacked. The organisers stipulated we had to have a minimum of 2,000 calories per day, plus compulsory kit: sleeping bag, head torch, spare batteries, 10 safety pins, compass with 1° or 2° precision, lighter, a whistle, knife with metal blade, topical disinfectant, anti-venom pump, signalling mirror, aluminium survival sheet, tube of sun cream, 200 Euros or equivalent in foreign currency and a first aid kit. Our packs could weigh anything from 6.5kg to 15kg, but the lighter the pack the better it was for conserving energy. We stood in line again for official checks to show our passport, signed doctor’s medical certificate and ECG (electrocardiogram) report. Once the organisers were satisfied, we were issued with our numbers (mine was 313), GPS responders for both bag and ankle (these would allow the organisers to know exactly where in that desert we were, and also family back home could keep a check on our progress), salt tablets and other bits of compulsory kit. It now began to dawn on me how serious this event was. Although no one was going to be holding your hand, it was reassuring to know that if any serious problem did arise, the organisation behind the scenes was more than capable of handling any situation. It was at this point we had a slight problem and for a few minutes we thought the adventure would end before we began. Tony’s ECG had a word on it, abnormal, which back in England simply meant no problem other than he had a slightly different heartbeat. Our doctors put it down to all the training he’d done; sometimes this happens to people. However, the French doctors took it to mean something else. We had some intense conversation trying to explain, and thankfully they agreed to let Tony run with one proviso: at every checkpoint, and at the end of each day he was to have an ECG test. I couldn’t believe that in the middle of the desert they had a portable ECG facility! Again, I was impressed by how organised this event was. We breathed a sigh of relief because no Tony taking part meant no Dave either; the stipulation had been I had to have two guides, so both Tony and Rosemary were very important bits of kit. Formalities over, we waited for a heavy sandstorm to blow over, and met up with Sir Ranulph Fiennes. We had a good laugh at the prospect of the camel catching us: when everyone has started on a morning, the organisers set off a camel in pursuit, and if it catches up and overtakes you, you’re out! Sir Ranulph said he would have a quiet word with that camel, and I guess he must have, as it never caught up with us! After talking to him many times on email, it was nice to meet in person. We had a walk around the bivouac, and took a few photos with my Baggies shirt on and the black country flag. We bumped into a family who were taking part: husband and wife, mother and brother-in-law, all from Windermere. We came across them many times through the event and hopefully at some point will visit them when we’re in the Lake District. Night-time comes early in the desert, and the whole camp was slowly quietening down, mentally preparing for the start. I couldn’t believe how heavy my bag was: 10kg, and I had to add a litre and half of water to it yet! I also thought about my number, 313. We flew out on the 3rd and hopefully would fly back on the 13th. My first adventure when I ran 7 marathons, ended on 13th April, so 313 felt quite significant. Rosemary read me letters written by my two youngest children, sending me on my way with love and kisses. On previous challenges, I’ve had a photo of the family with me, but this year I had an imprint of the three girls and my wife Deb’s fingerprints in a silver ingot, so once again they would be with me every step of the journey. On 5th April the bivouac started waking up at 5:30 and we were a hive of industry. We fetched water rations and boiled water for breakfast and drinks. Breakfast, dinner and tea mainly comprised Extreme Adventure foods: freeze dried, high-energy and importantly, low-weight. By adding hot water, it made for a sumptuous meal! With no dishwasher, I licked my spoon clean; the taste of sand grew on me over the week, too! We stowed our kit in bags, filled the water bottles, applied the important sun lotion, and all the little rituals that would happen every morning for the next week. The camp came alive, the tents were lifted literally from above our heads, and vehicles started up to make their way to the checkpoints. There was excited chatter everywhere. Slowly all the competitors made their way to the start line. Many nationalities were all coming together, many photos were taken, and even now we could feel the camaraderie building. What always amazes me, is that standing with 1,300 other competitors, that silent moment can still come upon you. I stood lost in my own thoughts, thinking of family back home; how Tony and Rosie had put themselves out to support me; and the reason I was standing here: The Albion Foundation. This was part of the Tri Albion Challenge, consisting of a 170 mile bike-ride earlier in the year from Southampton to the Hawthorns; a walk by the blind footballers team around Sandwell, taking in every school; and the final bit, our little trek across the Sahara. The Foundation does some fantastic work with blind football, wheelchair football and other disability sports, and work with vulnerable and disadvantaged kids. Through sports and working together, they encourage self esteem and independence and show these kids that they have a life to grab onto. Being in that world myself, and knowing the difficulties they face, gives me fuel to really want to succeed. Could this blind old codger from West Brom show these kids what’s possible? My determined feeling took hold. Then my thoughts were interrupted by a football fan! Due to having no phone signals, I didn’t get the results of Saturday’s games. To my surprise, I was approached by a QPR fan. Seeing my Albion badge, I guess he couldn’t help himself, and he let me know they beat us four one. The look and smile from me must have said it all! We were then all encouraged to gather in a roped-off area. This was the 30th anniversary of the Marathon des Sables, so all competitors formed the number 30 and an aerial photograph was taken. Tony and Rosemary described a fantastic spectacle to me: a dozen riders, 6 on horseback and 6 on camels, rode across the desert towards us. They said it was an amazing sight. Loudspeakers burst into life, presentations were made, and birthdays were announced, followed by loud music. There were helicopters flying all around, and I’m guessing they were taking videos and photos. The atmosphere was electric, and then was the sound of the start! We were off and running. The start, and those first moments, will be etched in my mind forever. I can only imagine the sight of it, but I heard the noise from the speakers, the helicopter flying low overhead filming the moment, and shouts from everywhere; I think everyone was glad to get going. My initial thoughts were: I’m not actually running on sand! I had imagined the Sahara desert to be soft sand, sending your feet flailing deep, left and right, crossing rolling sand dunes, but the ground underfoot initially was hard, rocky, full of camel grass, and ridged, as if water had formed ridges and funnels over thousands of years – different, but so fantastic. Our trek took us a few hours and 13.4km to Checkpoint 1. Reaching it was magic. I heard for the first time the two beeps caused by the responder on our ankles; at each checkpoint and finish line, we would cross a matting designed to plot our position. Over the week, this was a noise that was always going to represent sanctuary and the chance of a five minute rest. Tony pulled into the medical tent for his first of many ECG tests. He wasn’t happy, but it had to be done. We topped up our water bottles then off we went again, heading for Checkpoint 2, at 24.8km. It was ridiculously hot and with the terrain so bad underfoot, the order of the day was now walking. 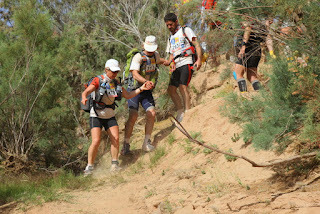 By Checkpoint 2 we had run and walked over hard, stony ground, with rocks as big as your fist up to the size of a barrel, dried river beds, camel grasses, and sand dunes inclining up and down. At 30km we encountered our first real technical assent: a mountain! I still hadn’t imagined mountains in the Sahara, but there they were! Tony warned we were going up for as far as the eye could see. There was a long line of people looking like ants in the distance, going up the mountain pass, between the craggy rocks. Up we went, and at the pass we then became the ants in the distance for the long line of folks behind us. At this ridge, we could see the finish and the camp, 3km in the distance. It was a long, sandy, hot 3km, but the beeps came eventually: relief. Rosemary did a foot inspection, checking on blisters. She swore profusely at me! Tony and Rosemary had both gathered a blister or two but although my feet were sore, I had no blisters at all. Ann Marie had done exceptionally well, coming in the top 10 ladies. Sadly, Leslie had fallen and damaged her knee quite badly. So, with all our war wounds, we settled in for the night. Over the next few hours and into the early morning, the wind picked up and the tent blew about, not quite collapsing completely, but a few tent poles rattled, the sides lifted, and I wasn’t sure if I was in the tent or out. All sorts of items blew everywhere, and with around a 40 mile an hour sandstorm, that sand was everywhere and into everything too! I have to admit I did some moaning, but the uncertainty of what was going on unnerved me. I pulled the zip up on my sleeping bag, and sleep came eventually. The road book was read to me, and now I wasn’t looking forward to today’s stage at all: the mountain day! Rosemary and Tony had been totally surprised when they read about this stage, and thought it better not to say anything until the morning. To begin, we got in some quite good running, and then the first of three mountain ranges came upon us. This first one was not horrific, but we certainly worked hard up it. The paths leading up to the summit were only wide enough for one person, so I held on to the backpack of either Tony or Rosemary, feet colliding with rocks at every step. It was not an easy passage up, but those beeps at 12.6km and the first checkpoint, were very welcome. Tony popped off for his ECG. He had missed the second one yesterday and on reaching the finish at camp last night, got told very politely he wasn’t to miss any more. As the week went on, he looked forward to the break that came with the checks, and so did we! We left Checkpoint 1 and within minutes we were going up. I couldn’t believe what was being described. Rosemary told me it was one hell of a climb, and then we were confronted with a ridge. She estimated it to be around 2km in length and it looked very similar to a dragon’s back, which I interpreted as hard work. Our little team of three, amongst all the other ants, pulled, pushed and heaved up that mountain and onto the ridge. The ridge was simply a rocky road; I was told afterwards that it was sometimes as narrow as 2 foot, and other times 8 foot wide, with a sheer drop of over 1,500 feet. The rocks were ridiculous. At times I could stretch over; at times I was on all fours. I sat and slipped in between rocks, clambered up and over, it was just one very rocky assault course. Tony and Rosie clung onto me for dear life: one slip, I guess, and it would be more than a headache you got! We crossed this ridge painstakingly slowly, and eventually we slid down off the rocks onto sand. What a relief! Those bleeps came again, and believe me, not soon enough. At Checkpoint 2, after 24.6km, we had water and a scoop of food, a mix I’d brought from home: nuts, dried fruit and smarties. How nice this was, and it filled the gap on many occasions. We set off for the little matter of another mountain before the finish. I thought to myself, after the first two ranges, especially the second, it couldn’t get any worse! Oh, how wrong you can be! The sun was very hot and Tony and Rosemary were trying to see where the ant line was going: I heard a simultaneous “Oh no!” – up, yet again. It was a finger of sand approximately 600 foot up, and then the rock face went sheer! We climbed that sand dune with feet going everywhere but up: three steps forward and two back. We joined the line of ant people, and the wind picked up a bit and Tony’s hat blew off into the distance – not good in this heat, but he was definitely, as he put it, not going back down to retrieve it. We took a diagonal line across the dune, bypassing loads of people, but no one seemed to mind, and I don’t think anyone was in a great hurry to climb! Then we hit the rocks and the climbing began. The rocks were once again ridiculous, all at varying heights. Some were three foot high, some lower, some jagged, and some smooth. We scrambled up on our knees, Tony at the front literally pulling me up at times, with Rosemary either pushing or guiding my feet to a safe spot on the rocks for me to push. We just kept on going up. Then it went vertical, and at this point the organisers must have realised the seriousness of the climb, and had put in some support in the way of rope. I say rope; it seemed more like a washing line with knots in, but it did help some. Tony and Rosemary were not happy, as the rope meant their hands were off me, and they didn’t like the thought of losing me. I was told later that at times I was perched on a ledge about a foot wide with a sheer drop of around 1,500 foot. Better I knew it after the event. Tony stressed to me quite strongly, “Don’t, whatever you do, lose that bloody rope!” Rosemary encouraged me to lean right into the rock face. She sounded so calm, but afterwards told me she was terrified of letting go. This stretch of the mountain range showed how the camaraderie amongst competitors had grown. When a chap we knew as Bernie, along with many others, was firmly on our tails, Rosemary suggested we let them pass as we might be a lot slower than them. But the answer that came back was superb: “We’ll stay behind. We can’t believe how you three are coping climbing this mountain. We’ll stay behind you just in case you need any help.” That summed up the nature of the other competitors! This day reiterated how tough this event was; that rope and 150 foot of climbing, at this point in particular, demanded our complete attention. The rocks were simply relentless. Was it good to get to the top after all the grunting, grimacing and hard work! Tony put a smile on my face with, “You know Dave, a blind bloke shouldn’t be up here!” We had a five minute rest, a sip of water, gathered our thoughts and then plodded on. From all the pulling of me up, Tony was totally knackered. 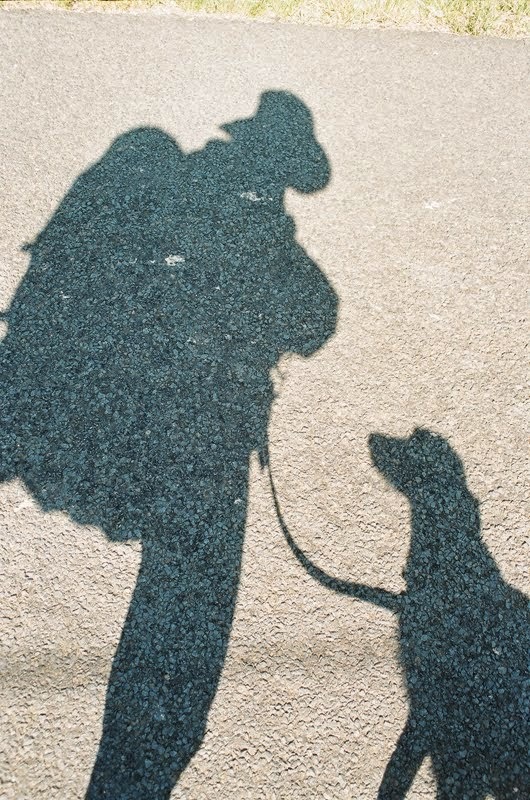 The ground levelled off and got smooth underfoot, so Rosemary took over for a while, and with my hand on her backpack we began to trot. We managed around 20 yards. As we were at the top, we would now be descending, but we suddenly stopped. After Rosemary explained what she saw, that smile left my face! Her description was simple: it was as though someone had taken a quarry full of stone and chucked it off the cliff! There were boulders and rocks of all shapes and sizes. Had I been sighted it would’ve proved no problem, as there were rocks with a good surface so you could literally leap from one to the other, but being blind the trick was to miss the gaps. So we began the long, tedious journey of sitting and dropping into those crevices, clambering up and over, going down backwards, in, out, up and down. That 2km distance down turned into a nightmare. Off the back of this mountain, Sir Ranulph passed us. I’m told he was leaping from rock to rock like a gazelle. Sight, for a few minutes, would have saved us hours! We did come across some dried river beds which gave us respite for a few moments, but then the hard slog came at us again. I asked the question many times of Rosie, “Can you see the bottom yet?” and the answer was always, “No.” Eventually after about an hour and half we hit the bottom, and sand! Was I glad to feel that sand! The heat was up and the sand was soft but I didn’t care; we only had 3km left to go. The run in (or walk, as the case may be), took us over a rolling dune. Around half a kilometre from the finish we came upon Patrick, a French, partially-sighted chap with his 5 guides, so we all linked arms and finished as a French-British combination. Our legs were battered, but it was great to hear they could see the end; even better when I heard the bleeps! We found Tent 124 and collapsed, Ann Marie was triumphant: she was still in the top 10 and slowly moving up, but to our surprise Leslie wasn’t back yet. Food was needed, along with a nice cup of coffee, but to my horror the packet with coffee, tea and sugar was not in my bag. Oh no! Disaster! Leslie came back much later and our thoughts of coffee vanished. She’d had to pull out – the injury from yesterday’s fall was too bad to continue. I remembered a conversation from months ago with an ex armed forces chap who attempted the MDS last year. He had also been a casualty of the second day, through no fault of his own. He’d crossed the finish line that day, but the heat and exhaustion had brought on a hidden virus which caused him to collapse and he had to be flown out of the desert that instant. He spent the next week in a coma. To have Deb listen to this story was not the best thing. She did question my sanity afterwards! Admittedly that was a rare occurrence, but it showed the seriousness of this event. I can understand why the organisers took us through a strict medical check and even then things get past them. For Leslie in this instance, a simple fall caused enough damage to stop her, after all that training, and planning. We were all gutted along with her, and Tent 124 was quiet for a long time. The only consolation was that Tony could borrow her hat. The night drew in, we pulled up our sleeping bag zips, and the wind started to blow. The dawn seemed to come so quickly. We’d had very little sleep as the wind in the night was unbelievable, and when we woke this morning, our tent was pretty well on its knees! We had the tent that always catches the wind. The others said, looking around the rest of the camp, that everyone else’s was still standing! Spirits rallied for the start. There were birthday announcements, the previous day’s casualties told - sadly our tent had one this morning – then the music, the helicopters and we set off. From the road book, today was primarily sand dune day – an easier day. After the lack of sleep, the battering our legs took yesterday, tired minds and tired bodies, no one could convince me any part of this adventure was easy. The sand dunes came upon us in the corrugated landscape, with the camel grasses. I had my first fall today: normally, camel grass parted as we passed through, but there was a large, firm root in the middle of the one my foot connected with, and I unceremoniously hit the floor. We trudged on with the sun beating down. Checkpoint 1 at 14km, was heaven. After endless sand dunes and dried river beds, we crossed what appeared to be a dried lake, and Checkpoint 2 at 25.9km was certainly a very welcome bleep. At the end of the day we hit a progressive climb: a small, sandy mountain. Its descent took us into more sand dunes, and that last few kilometres of intense heat and heavy legs, seemed to drain the body and mind. Time stood still and if ever I wanted to hear two solid wonderful bleeps, it was now. The finish line couldn’t come quickly enough today. We collected our water rations, found Tent 124 and collapsed… and then I shot up again like a rocket! Each day, when the camp is moved, it’s re-erected in identical layout, with no extra gaps between tents. Ours had a bush full of tiny thorns right in the middle, and I’d sat on it! Those thorns hurt, and as I was only wearing shorts they made me move pretty quickly – still, it gave everyone a laugh after the day we’d had. We also had some great news: Ann Marie had moved up to 2nd place in the women’s race; she was doing exceptionally well. With trainers off came the obligatory blister check. Tony and Rosemary’s feet were in a shocking state. On checking mine, Rosie gave a few choice words, as I hadn’t got one blister. My feet were sore, but otherwise unblemished. The night came in, and we were really looking forward to another night on the desert floor. We might even catch some sleep. We zipped up as the wind and sand started their nightly ritual. After another night of high winds and sandstorms, the tent was lower than it should be, and we hadn’t slept much. We had 91.7 km today. This was the longest long day in the 30 years of the MDS, so the question I asked was, Why didn’t we do the 29th instead? In fact, it would be a day and night job. The elite boys and girls were lucky enough to have a very late start this morning and it was fantastic to have them clapping, encouraging and supporting us as we left, into the sand dunes, accompanied by a 40km sandstorm. Pulling into Checkpoint 1 after covering 12.2km through a sandstorm, was wonderful. We cracked on and passed what must have been the equivalent of a resort camp! It was a holiday retreat in the middle of nowhere, and very desolate; why anyone would want to stay there is beyond me, but it takes all sorts, I guess. Just before we came across Checkpoint 2 at 26km, the elite runners started to pass us. They were covering the ground quickly. Tony and Rosemary had a discussion about a mountain in the distance. They couldn’t make up their minds whether the people-ants in the distance were going round or up and over. As we got closer, they both exclaimed “They’re actually going over!” We had a mountain in today’s 91.7km. I simply couldn’t believe we were going up another mountain – not today of all days! So we went up, climbing and clambering over rocks. There were corridors of rock, at times the path only allowing single file. We had a plan for this: when I held onto the back of a pack we sang the song, “Left, right, left, right, you’re in the army now,” so as to keep our feet in sync and not trip each other up. It worked, and with grunting and effort, we eventually got to the top. Then I heard, “Who’s going to tell him?” I stood wondering, “Whatever is coming next?” They described the descent: it was rather a long way down, very steep – in fact, almost sheer. Tony put my hands on a rope, also resembling a washing line, and told me whatever I did, don’t lose it or walk backwards. There was around a two- to three-hundred foot drop of rock. I was not the only one holding the rope, and it was moving all over the place. Then it ran out. Where my mind was now is anyone’s guess. No rope?! So what is coming next? I felt sand underfoot. Rosemary grabbed me and told me to turn around, relax, dig my heels in and slide. We dropped a very long way, literally skiing through sand. It felt like an eternity, but I’m told it was around 300 metres, and then we hit more rocks. It was quite frightening, but also exciting. Putting my life in the hands of someone else, and seeming literally to drop down that mountain – that is where the trust comes in. I had a GoPro camera on my head, and turned around to film the route behind us. Tipping my head up, Rosemary tilted it even further. I was almost bent double backwards. It was then that I realized the full extent of the descent we’d just made! There was still more descent to come. From the top we’d cleared rocks, then sand, and now rocks again. We covered over a kilometre, and boy, was I glad to get off that mountain. We took a rocky road to Checkpoint 3 at 37.8km and had a welcome rest. Checkpoint 4 was at 50.2km, and this was the halfway mark. It had a great psychological effect: instead of counting the checkpoints up, we now started to count down to the finish – admittedly still a long way to go. Many competitors decided to camp here for a few hours and sleep, but we made this our meal stop. We found a tent and prepared tea. Here, I had a conversation with a French chap, a doctor. Last year he volunteered his services for the event, and having spent the week treating others, thought this year he would actually run the marathon to get the view from both sides. He was very quick to tell me that he would never come back as a competitor again; doctor and volunteer, yes, but this would be his first and only time taking part. This might be the view of a lot of people, come the finish! Night-time fell, we left Checkpoint 4 with a terrific sandstorm blowing, and started up a sand dune. It went up and up, in fact, all the way to Checkpoint 5. It was very windy, with sand swirling all around. The sand dune was telling on our legs, and our glow sticks and head torches provided the only light. Checkpoint 5 came eventually at 63.3km. A nice surprise greeted us here: the organisers had set out deckchairs, and while having a welcome rest, it was great to sit down on an actual chair! Although the Sahara desert is a daunting place, it was amazing to sit there, have a drink, and enjoy the delights of a packet of KVE pork scratchings (to the envy of a lot of other competitors) at 1:20 in the morning! It was at this point that Rosemary had a slight blip. She was very tired, so we had a 20 minute stay to give her a power nap. It wasn’t long, but she got up again, and we think she was sleepwalking for the next couple of checkpoints! She was very quiet, which is unusual for her too. The sandstorm was still blowing so to keep our spirits up Tony gave me a quiz on the walk. “Name me 20 John Wayne films,” followed later by, “Name me 20 Clint Eastwood films.” This kept us marching along. We then became the Pied Piper. There were loads of people all around us, and whilst we seemed to be walking in a straight line, other competitors kept walking around us, and for a long time kept bumping into Tony, much to his annoyance. There were miles of desert around us, but everyone seemed to be in our footsteps. Then Tony jumped and shouted! He frightened the life out of me. A long strand of desert grass caught his foot and he thought a snake had got him. It certainly livened up the party. The sand dune accompanied us into Checkpoint 6, at 74.8km. Here, we had a quick stop, filled the water bottles, and carried on. The next checkpoint was the last one before the end. The sand dune was still with us; it had slowly inclined all the way. Tony remarked if it went up any more we could touch the moon. Rosemary was still quiet. Eventually I heard that wonderful bleep that was Checkpoint 7, at 85.7km, at 6:30 in the morning. People were sleeping all around us, but with only 6km left to do, we pushed on. Dawn would soon be upon us, so I asked Tony to catch the sun coming up on the GoPro. I never saw the sun rise, but I felt the heat. I’m told it was a magical sight. Our road map told us from here there was a good running surface, but it was not the case: there were boulders and rocks everywhere. We ploughed on, Rosemary now back to life. Tony gave us a spelling test (funny, considering he can’t spell), and strangely enough it got Rosie and me challenging with different words, to the amusement of Tony. As I’d predicted, 8am came and went with us still on the go. Suddenly, Tony got a phone signal; we hadn’t had one for 2 days. With just over 3km to go, a text came through from Deb. They were tracking us back home and wanted to know what was taking us so long. Could we get a move on, as she was waiting to go out. This brought a great big smile on my face. Deb, from thousands of miles away, could still spur me on. After 90km, we began to run for that finish line! Rosemary exclaimed, “Dave, I can see the finish line – it’s about 1,200 metres away.” She told me 5 times it was only 1,200 metres away. What we didn’t realise was we were not only going forward, but slightly up and down too. With Deb telling us to hurry up, and Rosemary telling me for the last time it was only 1,200 metres, we tripped, stumbled and just kept running. That finish line was now within our grasp! Deb texted to say she was expecting a finish dance for the camera. After 24 hours and 55 minutes, we heard the most rewarding two bleeps on the finish line. I did the most ridiculous dance I could muster, with one hell of a smile. We collected our water, stumbled to our tent, took our packs off, and lay on whatever was on the floor, simply resting and then trying to take in what we had just done! We took our trainers off to assess the damage: again, not a blister on my feet. Tony was in all sorts of pain, and Rosemary was in agony. She decided to see the foot doctor to get prepared for the next morning. A couple of hours later Rosemary returned, feeling slightly better, and explained the whole remarkable procedure. There were some 190 other people needing attention. You showed your number, then sat with your feet up, cleaned them with disinfectant, and placed surgical over-shoes on them until your turn came. Then the nurse treated the blisters, cutting and slicing with great care. When the iodine was put on, screams could be heard. Your feet were then expertly taped and bandaged to enable you to continue. The detail of the blister on one of her heels made me wince. She said it was as big as an orange, and blood spurted as it was cut – very painful. I was so glad I wasn’t joining their blister gang! Rosemary told us there seemed to be over 70 medical personnel, with 20 dedicated to feet. It showed the incredible support that was offered to the competitors. People came in periodically through the day. There was an exhausted feeling throughout the camp, but the mood was still high, everyone knowing that tomorrow was the last day and the finish, barring an accident. We rested all day, and sorted out our packs. I couldn’t believe how heavy my pack still was. I counted the meals I needed for the remainder, discarding whatever I could, but that pack was still heavy; Tony and Rosie couldn’t believe it. The last person came in just before the 36 hour deadline. I did feel sorry for them. It was an early start the following day, and their rest would be nominal. As a bit of a prize, the organisers gave us all a small can of coke, and we decided to save ours for tomorrow as a little pick me up. Once our sleeping bags were zipped up, the wind and sand began to blow. The wind in the night had been horrendous, and we were all up well before dawn. After hardly any sleep, I sat on my sleeping bag pulling on my kit, with Tony laughing. “You don’t know where you are do you?” Replying, I said, “Not exactly. Somewhere in the Sahara, sitting on my sleeping bag getting dressed in this tent.” “No, I mean you don’t know what’s happened!” I was still nonplussed, but Tony went on to say the tent had actually blown down in the night! Rosemary and Anne Marie were underneath it, using it as a blanket. Both Tony and I had literally been sleeping under the stars. I did wonder, at some point in the night, why the wind didn’t seem as noisy. The reason was, it had no tent to blow through. After that, I’d zipped up completely and must have slept. I did wonder why I was covered in more sand than usual. The morning ritual started, only this morning with a bit more pain thrown in. Tony struggled to get his trainers on, and poor old Rosie whimpered at just the thought, then even more as she tried to put them on. She had to cut her trainers in the end, and her mice impressions of pain followed us all day. She was literally squeaking in pain with every step. I believe we all welcomed the start at 7am, for many different reasons; there were certainly some with war wounds on that start line. With the presentations came the sad news that Bernie, the chap from the mountain day, had pulled out on the long day – there was an ever-increasing list of casualties. Today was a mixture of all sorts of terrain: hard rutted sand, corrugated sand with small ridges, large ridges, hard ground with many stones and rocks. We hit our first checkpoint at 12.5km, and as we had run practically all of this distance, stopping was good. We all three shared a small can of coke, the noise of that can opening tormenting others! The ground was the same to Checkpoint 2 at 24.6km, so again we managed to run most of it, and again had an enviable can of coke. Just a couple of sips each hit the spot. From here we had similar ground, with the obligatory sand dunes thrown in too, and the temperature hotting up. The third and final checkpoint came at 33.7km. Other than the finish, it was the last checkpoint of the whole event. Superb: only one set of bleeps left! After leaving Checkpoint 3 we could smell the finish, and although the ground underfoot was now slightly worse, with about 5km to go, Tony did his normal attempt at winding me up! As we began to climb a slight incline, with Rosemary in cahoots, he told me that he could see Patrick, the French partially-sighted chap, along with his guides ahead of us, so I upped the anti, the legs finding strength from somewhere. It was at the top of this incline that Tony exclaimed, “I was winding you up before, but Patrick is really in front now.” I didn’t need any more encouragement – my legs automatically quickened up, but Rosie was telling me not to go any faster. This time we passed Patrick and his crew, Tony filming as we ran, and Rosie hanging on to the running cord. I was shouting Boing Boing all the way in; we crossed the line as one, all bleeps together. 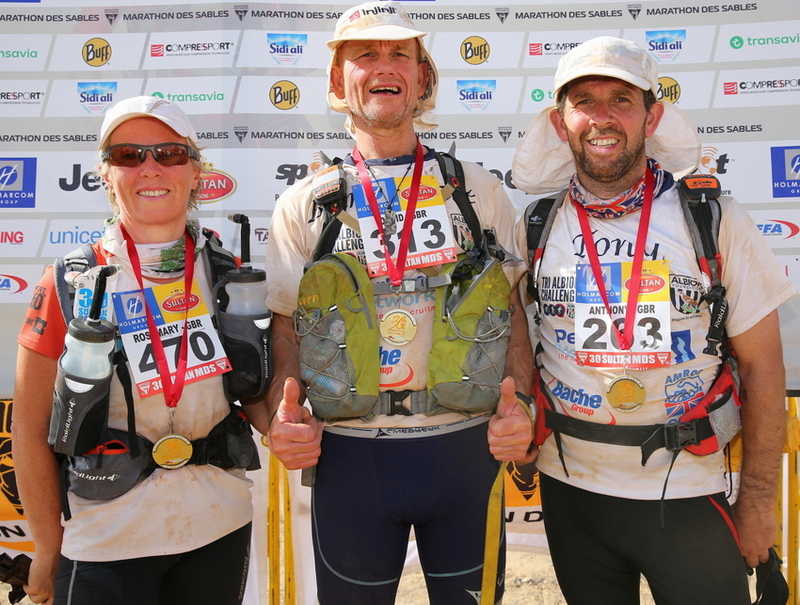 We had completed the 30th Marathon des Sables. There were hugs, tears, smiles, and the daft little dance again – who cared. The medal was draped around my neck. We had done it. Our great little team had pulled together. This moment would live with me forever. The camp sounded jubilant, with claps and congratulations ringing out all around. Tent 124 was a happy place, painful but happy. Anne Marie had secured second place, and was first British lady – what an achievement. Then, whilst sitting and reminiscing, I put my hand in my pack and there in a lining I pulled out the bag with coffee, tea and sugar in. How good did that coffee taste! Later in the evening were the official presentations, and music from a live band. This would be our last night spent in a tent in the Sahara. Waking up the next morning, the tent was upright. I ate my last breakfast from a packet. There would be no more sand-caked spoon, no more Sahara floor, and no more sandstorms, just today’s charity walk or run. We were given shirts supporting UNICEF and a new number, and at 9am, off we went. It was very casual – even the elites strolled along. Our route went through, round and over the Merzouga sand dunes, the highest in Morocco. On the top we enjoyed a coke, and I filled a small bag with sand to take back for the kids. Then we came to the coaches, bound for Ouarzazate. As each coach filled, off it went. It was wonderful to sit down on a soft seat, slipping off those trainers. Imagine a coach full of runners, after almost 8 days in the desert, in the same clothes, having had no washing facilities to speak of. That poor driver! He had 6 hours of us and our desert odour! But he survived, and in Ouarzazate, the British were put up in the Berber Palace hotel. Within half an hour I was standing in a shower. What a feeling! It took three showers to feel anything like clean. Then we had a meal; then bed! Having been travelling most of Saturday I’d got no sports results yet, but in the hotel lobby another football fan approached me. “Morning Dave! I’m a fox’s fan. Just thought I’d let you know we beat you yesterday three two.” So our badge is recognisable all over the world. And talking of West Bromwich Albion, on our return on 13th April, we celebrated with a great reception back at the Hawthorns.